Too many hospitality brands think that, to create memories, guests want outstanding material luxuries. Lavish rooms, over the top villa designs, fancy electronics or one of a kind facilities, like in-villa swimming pools or jacuzzis. 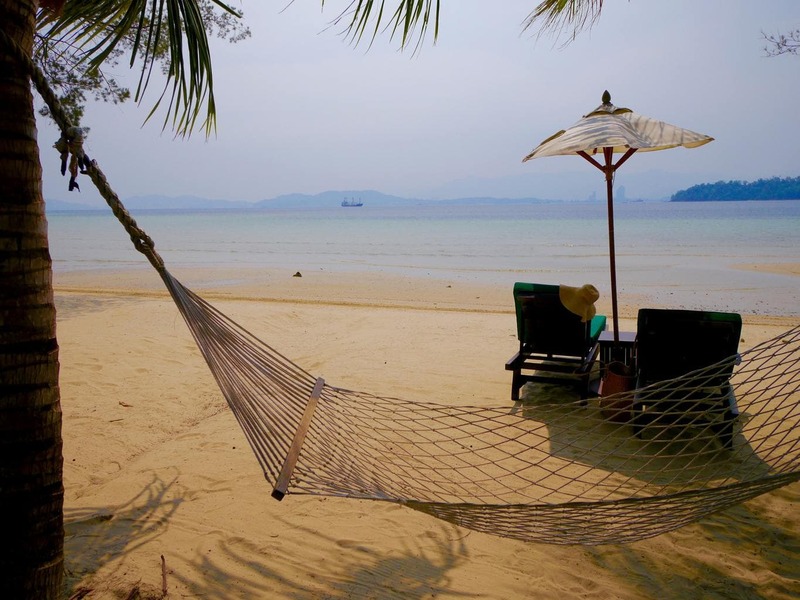 Although all these are certainly enough to get anyone excited about a vacation, they fall flat if the sole purpose of the resort is to make money. Luxury travelers want more. They want to be treated like guests, not just like customers, and they want to know that their money helps a greater good, beyond superficial marketing claims. This requires two things; genuinely committed staff and genuinely committed management. Hiring and keeping proud employees that can provide this level of personal touch is difficult. Well-rehearsed corporate messages eventually show. For it to be genuine it has to be true. Management’s commitment to the community and the environment has become the de facto PR message but the depth of such claims can be easily discovered. 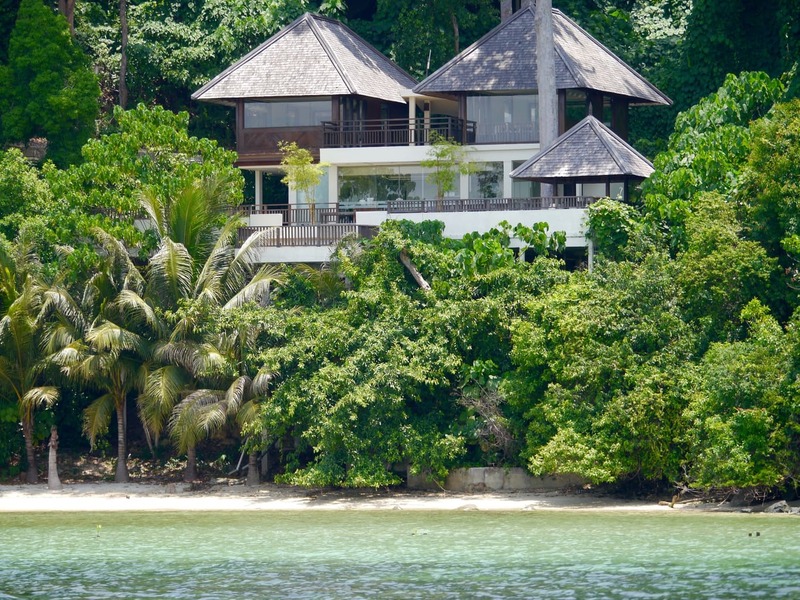 I recently visited Gaya Island Resort, in Borneo, and was impressed by both the staff’s warmth and hospitality and the resort’s true harmony with the surrounding: a concern for the preservation of the nature they owe their privileged location to. 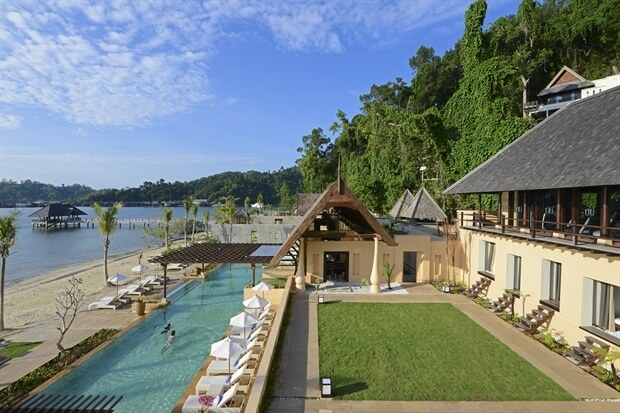 The resort is located on Gaya Island, near Manukan Island, the largest island within the Tunku Abdul Rahman National Park, and has been a forest reserve since 1923. Thick forestry and a wealth of hiking trails extending for kilometers covers most of the island. 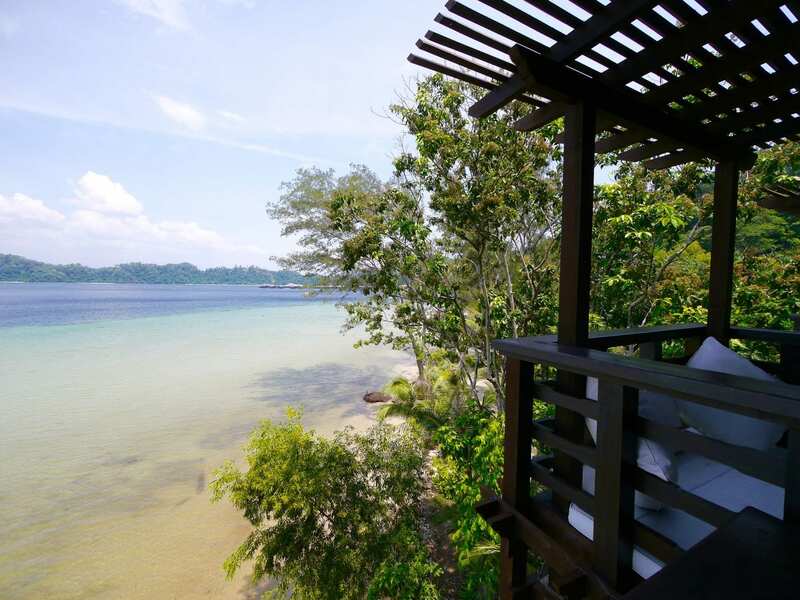 Reachable via a short fifteen minute boat ride from the ferry terminal, in turn just fifteen minutes from Kota Kinabalu airport, in Sabah State on the island of Borneo, the resort is terribly accessible and peacefully removed. Most people come to Borneo in search of the last undiscovered paradise. They sail rivers upstream tracking endangered rhinos; they trek through thick jungle in search of the endangered wild orang-utan. In my case, I was looking for an island getaway that would not require an obstacle race and which offered more than just sunbathing on a beautiful beach. From the airport, we were picked up by a resort’s van which drove us to Jesselton Point Ferry lounge where we had a short wait before our luggage was loaded onto the boat and we headed to the island. Our reservation was checked at the ferry lounge so there were few administrative steps left to complete when we arrived. 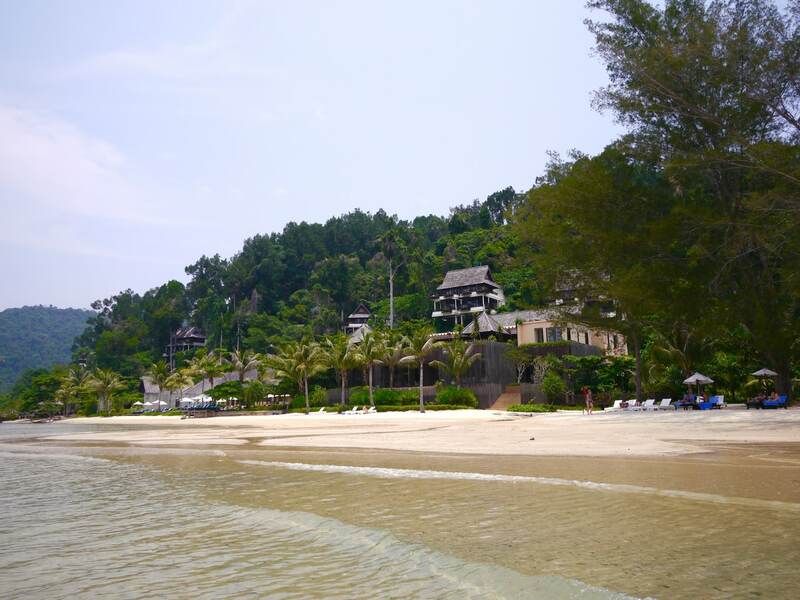 As soon as we stepped off the jetty the resort’s hill-perched villas and pretty beach took us somewhere far, far away. It was hard to imagine that there were 120 villas on the hills above the beach, for all you could see was, at most, ten of them. As we walked off the boat and onto the decked jetty, I spotted lots of colorful fish and healthy corals inside a buoyed area the resort had fenced off for snorkeling. A few more steps and we entered the reception where we got a lovely spa-y welcome drink. Janet, the receptionist, checked us in and escorted us to the villa. There were no buggies running up and down the resort’s path so guests have to walk through mangroves and shaded paths flanked by tall trees and lush overgrowing greenery. Cicadas serenaded our walk as we passed signs marking the start of forest trails. As we wandered towards the villa, Janet pointed at the facilities. 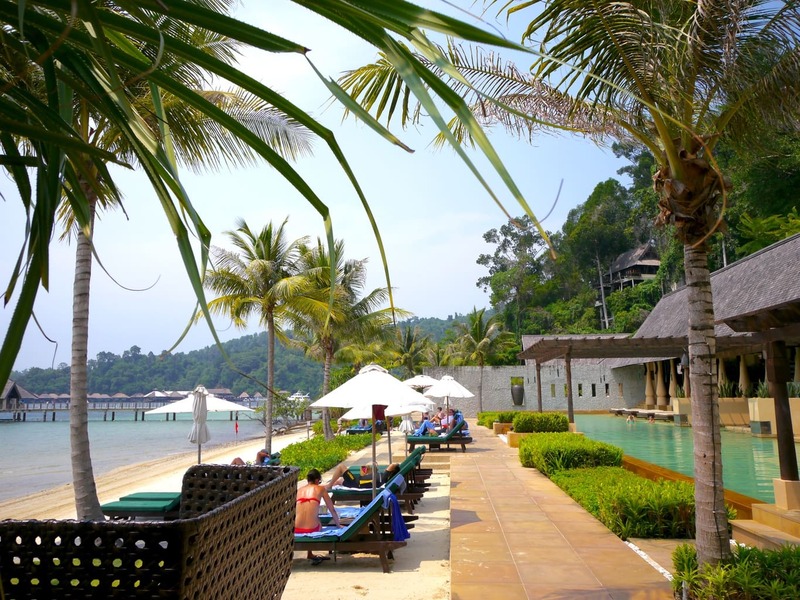 We strolled past the beach, the pool, the bar and the restaurants and, less than 3h after leaving Singapore, we were enjoying the views of our villa. All of the resort’s villas were the same size and the only difference were the views. Since the resort was spread on a hilly side sloping into the sea, all of the villas’ views were uninterrupted but by the lush vegetation. 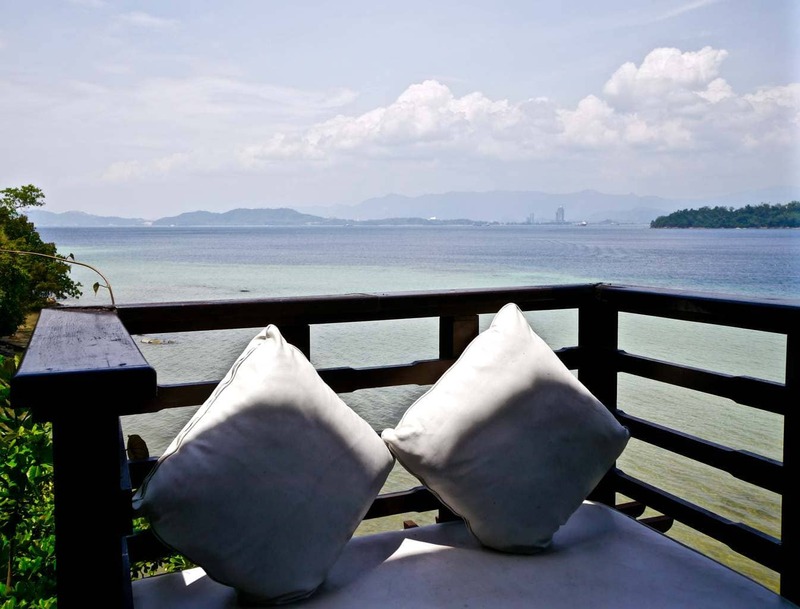 Although I initially thought the sea view villas, like the one we had, offered the best views, the jungle and mangrove views grew on me. Walking along the boardwalks over the mangroves and the shaded tropical forest was incredibly soothing and peaceful. Our villa was spacious and rectangular. We walked in through the outer edge of the corner, along the great sea views. As soon as we descended the small stairs from the jungle path, the anticipation started to build-up. We had the furthest away villa, a good ten minutes walk from the swimming pool, and, to the left of the terrace, there was nothing more than tropical forest and the blue expanse of the sea. The large outdoor veranda had two sofas at either corner, hanging above the void. Needless to say, we felt as if we were the only ones staying at the resort and had a remote island all to ourselves. The bedroom, opening into the veranda and the sea views, had a king size bed and a TV. In the mornings, the sun rose right in front of the villa so we just has to open the curtains to see the bright sphere of flames rise above the horizon. On a clear day, we could see Kota Kinabalu in the distance. Walking in, away from the terrace, there was a desk and a walk-in closet. Not that we were ever going to be able to stay in and do any work, but should we had to, we would have been rewarded by the views of the ocean. 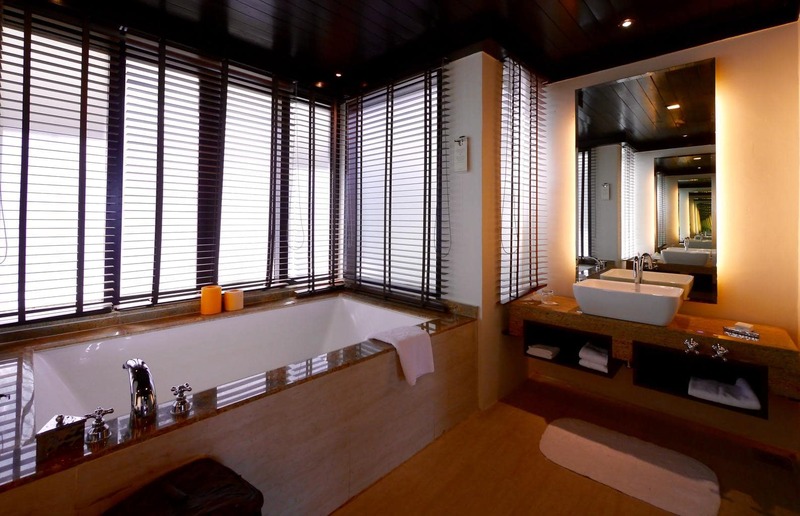 The bathroom was larger than the bedroom and featured a romantic, sunken, built-in bathtub large enough for two, a rain shower, a separate toilet and two vanity counters at either side of the bathtub. Needless to say, the bathroom was every girls dream: huge, bright and with a bathtub resembling a pool. There is something ostentatious about a large and unnecessary bathroom. 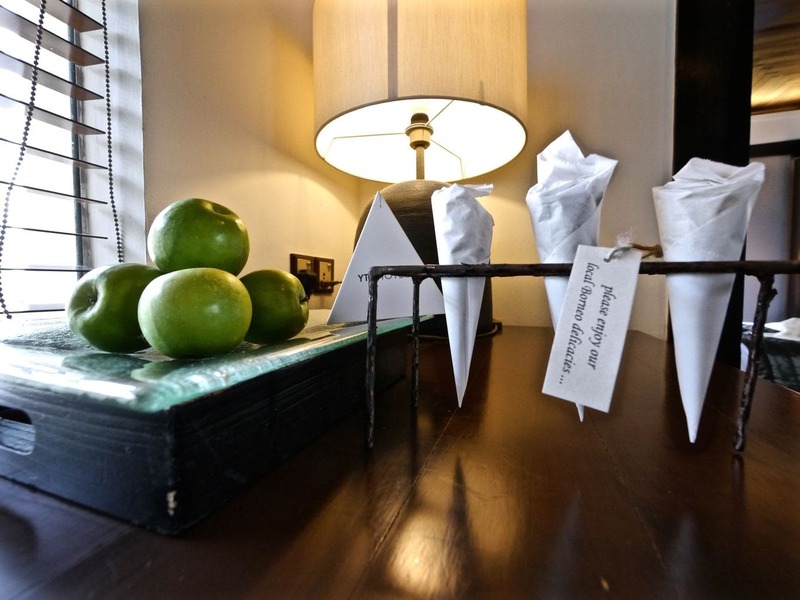 Several small details around the villa showed that a lot of thoughtfulness had gone into not just providing comfort and luxury but also the warmth of a personal touch, the type you would give a visiting friend. There were complimentary nuts rolled into paper cons on the table, unlimited supply of water, free snacks in the minibar and bath salts by the bathtub. 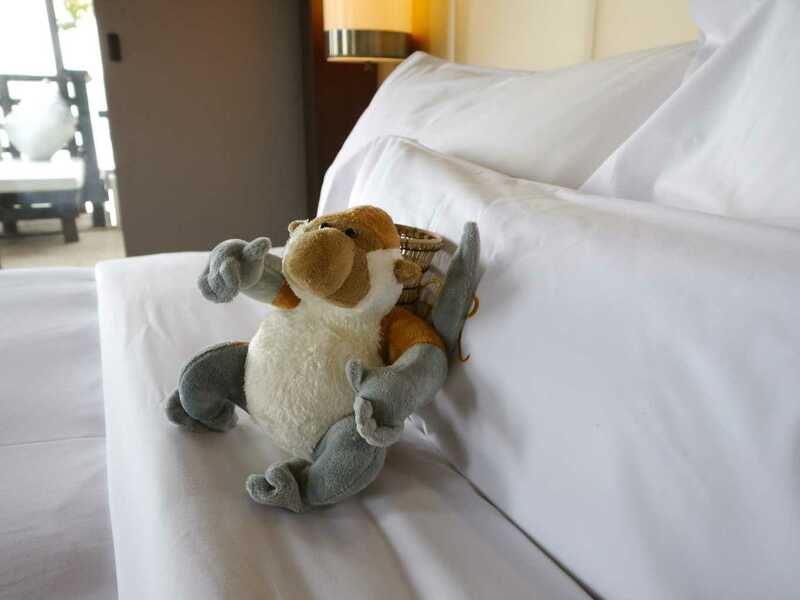 I had noticed a cute proboscis monkey teddy bear at the ferry lounge and, when I arrived in the room, a gift one was resting by the window, for me. The resort provided a weaved beach bag, an extremely handy item to put everything we needed for the day so we didn’t have to trek the ten minutes back every time we needed something from the villa. There were summer bathrobes and perfumed shower amenities including soap smelling like cucumber and shampoo with a touch of peach. The resort recycled the water and has several conservation and eco-friendly measures in place. In the villas, the hot air generated by the AC was re-used to heat the water for the shower. “If you want hot water, make sure to turn the AC on,” advised Janet. Before she left, she warned us, “Make sure to lock the doors when you leave, the monkeys have become really smart”. The excitement of getting our stuff stolen by a monkey quickly faded as I recalled that time in South Africa when I was scared-locked in my bush hut’s bathroom by large baboons which had got in and were eating everything they found in the kitchen. Not so cute then. 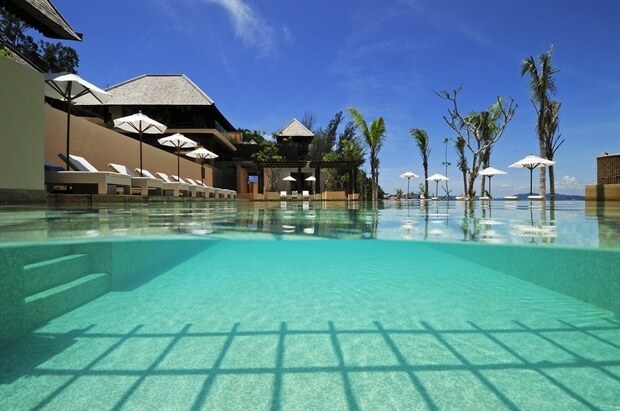 The resort’s swimming pool, perched above the beach, offered an almost infinity feel. There was a swim-up bar in the middle for a quick drink in the heat of the day and a few tables above for lunching by the blue. Floating day beds on the water were inviting me to just let go and fall asleep. The grassy bits between the pool and the sun beds showed the hotel understood how hot one’s feet could get on the sun-drenched tiles. Sun beds were scattered around the pool and beach area, in front of the pool, far apart from each other not to hear everyone’s conversations. For those looking for more tranquility, the hotel had placed several sun beds away from the main building, on the sand. The only sound on that part of the beach were the waves and the occasional wild boar roaming around. We enjoyed the shade from the umbrellas or the large trees and fell asleep to the sound of the tree leaves dancing in the breeze. Janet had told us about the hotel’s private beach five minutes away by boat from the resort on a secluded bay, but I had not paid any attention. I had wrongly assumed it was going to look much like the main beach. 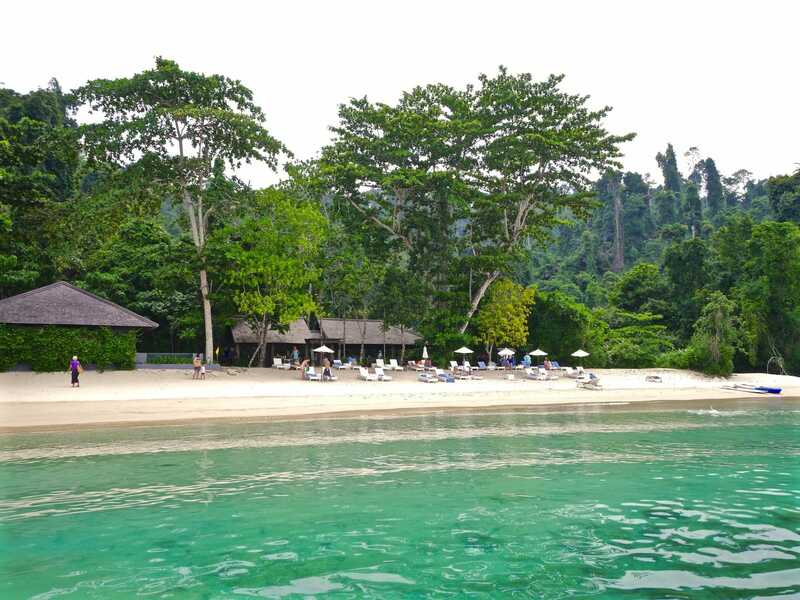 The private beach was not only a fabulously quiet stretch of fine sand and crystalline water, but it was also home to the resort’s Marine Center, the first one opened in Malaysia and managed by the resident Marine Biologist, Scott. Nature walks with Justin, the resident naturalist and snorkeling trips with Scott, were a treat. Their passion for conservation was contagious and the resort’s commitment to the surrounding a great sign of its long-term interest in the area beyond business pressures or financial returns. Their stories about building the resort from the ground up, discovering the trails that are now available for guests to trek or replanting the corals, were a beautiful insight into the good hospitality businesses around the world could do. I visited the private beach and spent some time with Scott and the rescued turtle he was caring for. 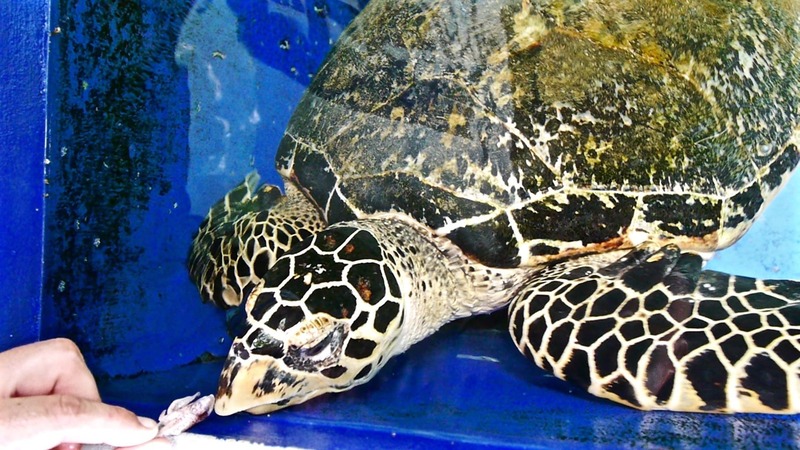 He arrived distressed, brought in by a fisherman, and it had taken Scott several days before he found the type of squid the turtle liked eating. Before that, he tried all sorts of sponges and jellyfish, in the process getting stung a few times. His job was a terribly rewarding yet difficult one. Turtles are not good patients. They don’t tell you what they will eat and can be very picky eaters. Scott took a small squid out and fed it to the lovely turtle. He came up to the surface to say hi and swallowed the squid in no time. The resort also offered early morning yoga and movie nights on the grass. Water sports like stand-up paddle or kayaking were a fitting way to build-up an appetite and we could also go diving. Since the resort was facing East the sun set behind the island. A sunset cruise onboard the resort’s luxury boat was a great way to wind up the day. The resort also offered cooking classes. 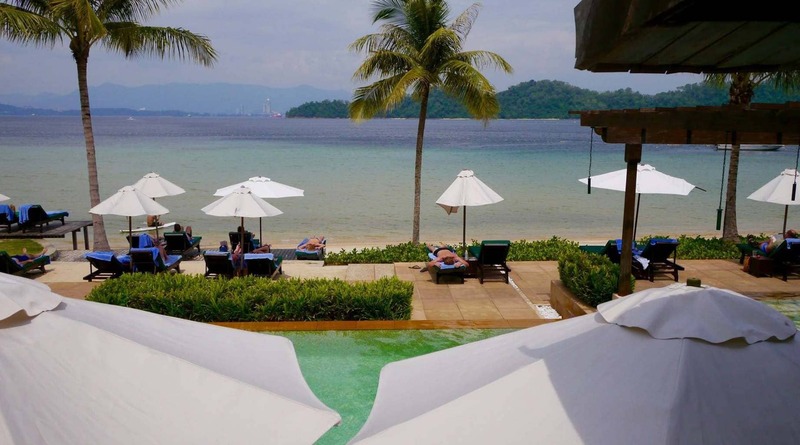 Most of the guests coming to Gaya Island Resort were spending a week at the resort combining a two week Malaysian vacation, so there were several options for food and beverage to make sure guests were not forced to repetition. 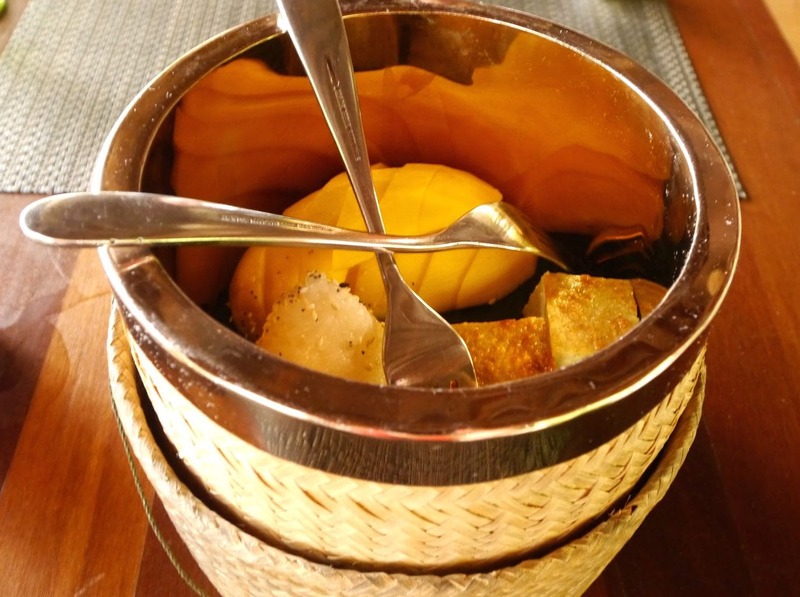 The main restaurant offered the usual buffet with quality local and international options. It was also the place where breakfast was served. Slightly elevated and overlooking the beach, the morning views on the few outside tables provided the peace that one needed after getting up. As most guests ate indoors, we enjoyed the quietness under the shade of a few palm trees. Malaysian and other Asian breakfast options were available as were eggs to order and a variety of buttery and flaky pastries, my favorite way to start the day. We picked our favorite fruits and got the staff to juice them for us. A lazy lunch could also be had by the pool. The menu featured bar snacks and typical Asian favorites plus sandwiches and salads. It was informal and a casual way to take a quick break from sun tanning. Because a vacation doesn’t have to mean a string of buffet meals the resort had two fine-dining options. The Japanese teppanyaki restaurant was the last addition to the resort, built in an effort to provide a refined alternative to the pricey fine-dining Fisherman’s Cove. Located up in the hills and offering live cooking for a few guests, the dishes were skillfully prepared in the show that a teppanyaki provides and complemented by a sweet tiramisu ending. Fisherman’s Cove was a beautiful rooftop seafood restaurant where we dined under the stars with views over Mount Kota Kinabalu. Joined by Justin and Scott, the meal was a glorious showcase of sophisticated interpretations of Malaysian and international recipes. Some of the dishes we had, like the smoked prawns, were a first for me and a world away from the typical beach resort food. Our meal was accompanied by a two-girl band who sang ballads and guitar songs. The meal could not end without the sweet finishing of a chocolate souffle, well worth the fifteen minute wait. 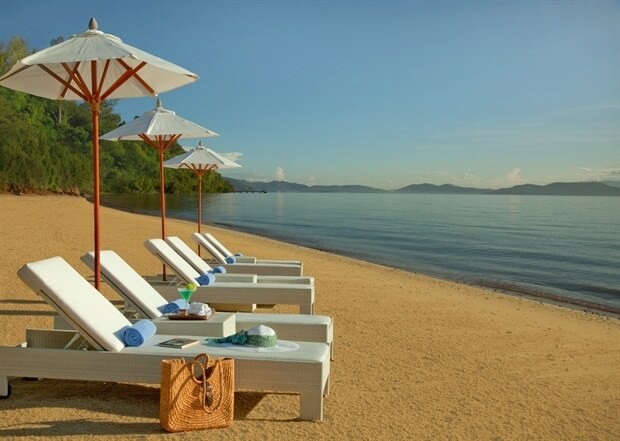 For a private dinner for two the resort could organize a secluded setting on the beach. 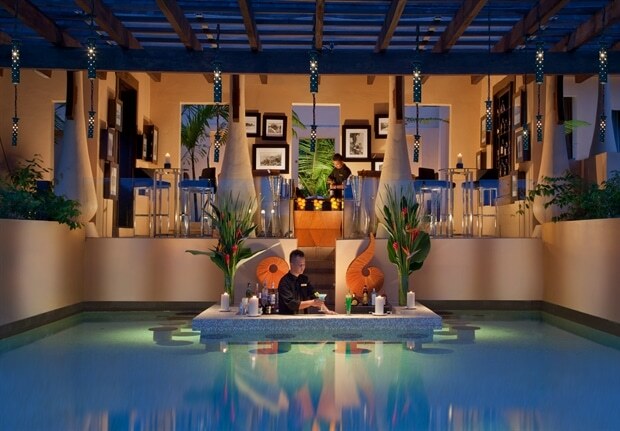 Although these types of private dinners are more and more common at five star resorts, they never get old. Enjoying a fine meal just a few steps from the waves is a luxury I could never take for granted. Add in a circle of candles on the sand and fresh flowers for that special life-in-two evening romance. The dining options didn’t end there. 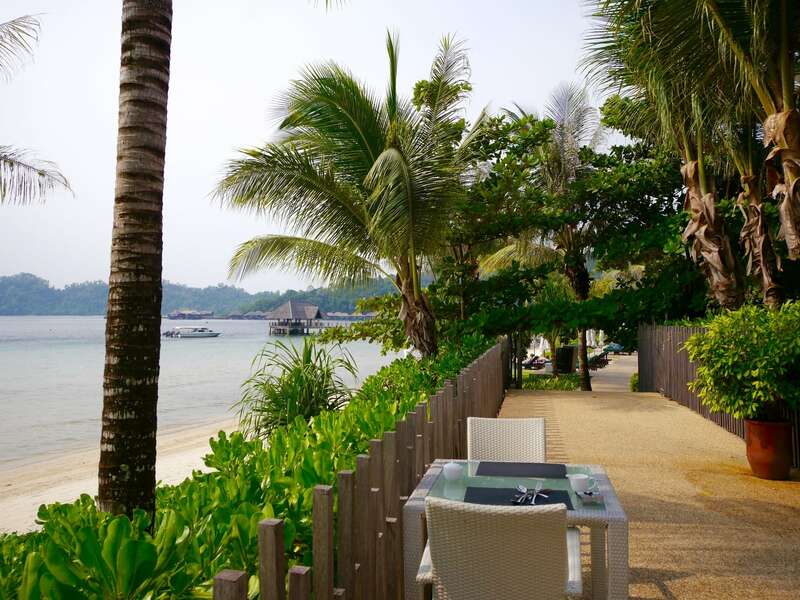 For lunch, we could also enjoy a picnic or a proper Thai meal under the shaded area in the private beach hut. The Thai food was exquisite. Refreshing and flavorful it was just what I needed after feeding turtles and wandering along the empty stretch of beach. It was casual yet sophisticated and, as an added bonus, I spotted the friendly wild pigs strolling around. A few times a week, the resort lights a bond fire around which a small group of guests can enjoy barbecue food under the tree canopy, their feet dipped into the cooling and relaxing sand. An innovative and brilliant idea to enjoy what we all go so far for, being one with nature with the simplest of life’s gifts: good company, warm evenings and fine sand between our toes. 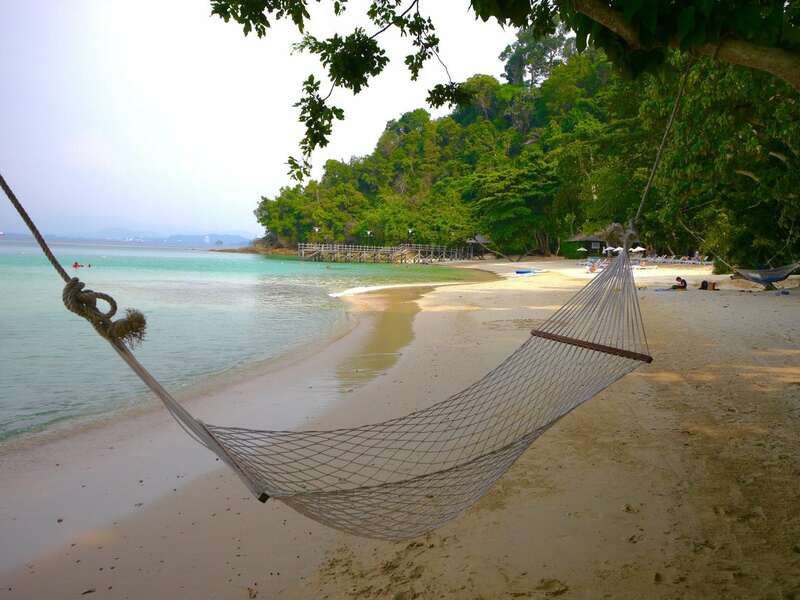 Gaya Island Resort won us over with their heartfelt hospitality and warmth. As we had to unfortunately test the clinic’s quality when my partner in crime had an upset stomach the staff were kind and concerned proactively doing their best to make him feel better, giving me bread buns and isotonic drinks aside from what the nurse prescribed. They took equal care in making sure that I was entertained and I could make the most of our time in their slice of paradise while he was taking a rest in the air-conditioned villa. From the moment we got out of the airport until the moment we were dropped off the resort’s staff made us feel like old friends. Service was honest, genuine and with a smile, the type of service that makes you want to come back. Sometimes, luxury is defined by the simplest of human values, empathy and care. A reason in itself to come to Gaya Island Resort, the Spa Village is a set of buildings and treatment roams spread over mangroves and among balconies of lush trees. The word peace does not even begin to explain the state in which I came out of our two hour signature treatment. I am addicted to massages and spas in general, I have at least one a week, for the last decade, so I am experienced spa-goer. Gaya Island resort Spa Village was a world away from what was already a tranquil island resort. We were booked for two Aki Nabalu treatments. We walked in the Spa Village after a good fifteen minute trek from our villa, at the other end of the resort, ready to be pampered head to toe. The receptionist was waiting for us and, without having to introduce ourselves or provide any details, she knew who we were and swiftly brought out the registration forms as we drank a refreshing citrus and lemongrass cooling drink and watched the koi fish wander about in the pond. The treatment started with an essential oils steam bath. As we zipped ourselves up into what looked like a cocoon, the wonderfully soothing masseuses were ready to give us water and pat our sweaty foreheads with a dry towel. I made it to almost the entire fifteen minutes we were supposed to be there, not Eddie, who, after just five minutes asked to be released from that rice cooker. I stayed strong as sweat poured down my cleavage, “This has to be good for you, right?”, I mentally reassured myself. I eventually succumbed to the heat and called for help. After being properly steamed we moved outside, to the spa suite’s balcony, overlooking the jungle and the sea below. Outside, a food rub and bath were awaiting. The masseuses were gentle and friendly, regularly checking that everything was good. We felt more and more relaxed and started to talk less and less as our eyes were progressively giving up. The birds were chirping away and the sounds of the jungle plus the persistent cicadas were lulling us into a deep relaxation. After fifteen minutes with our feet in the warm water a really cold orchid bath was ready to reactivate our circulation and bring us back into consciousness, if only for a few minutes. We were then helped inside and onto our massage tables. The ninety minute massage started with a check of the pressure I wanted. Once I was facing down on the comfortable table, I lost sight of the world. Concerned that I would fall asleep and drool all over the floor I made inhumane efforts to stay awake, but I lost to the relaxing music and the skilled hands of the masseuse. “Miss Maria, you need to turn around now,” I heard as I slowly returned to consciousness. “Ok,” I must have mumbled. When the massage ended, we were taken back to the reception. The sun had set completely as we sat back on a comfortable sofa for a delicious ginger tea. 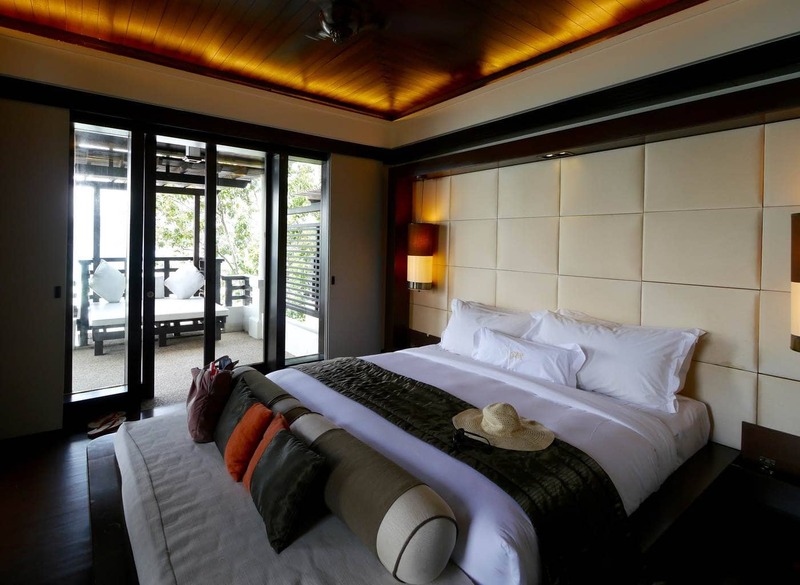 Gaya Island Resort is a gem, a mecca for those looking for a getaway from the city hassles in a luxury and friendly environment. It is a great destination for nature lovers and for those looking to just relax and, at just 3h from Singapore, a place of regular pilgrimage. Once in a Lifetime Journey was a guest of Gaya Island Resort. As always, all opinions are our own.